Dr. Thomas K. Hunt MD, an internationally known and respected surgeon, professor and researcher, has died at the age of 88. "TK" or "Papa Tom" as he was known by colleagues and family, was a general surgeon at the University of California from 1964 until 2001. He was best known for helping develop the trauma unit at San Francisco General Hospital and for his research on the cellular biology of wound healing. His easy-to-implement ideas shaped the standard of care for the prevention of infections after surgery. The cause of death was complications from a fall and broken hip. TK was part of the founding Board of Directors of the Wound Healing Society and served as president from 1989-1992. He was one of the Founding Editors of the Society Journal Wound Repair and Regeneration. He leaves behind a lasting impact on the wound healing community. "TK's passing marks an era in the timeline of Wound Healing Society (WHS) as well as in the development of wound healing sciences. As a young scientist, my proximity with TK was life changing. He was a major inspiration for me to enter into the field of wound healing research. His passion, energy, friendship and innovative ideas will be greatly missed. 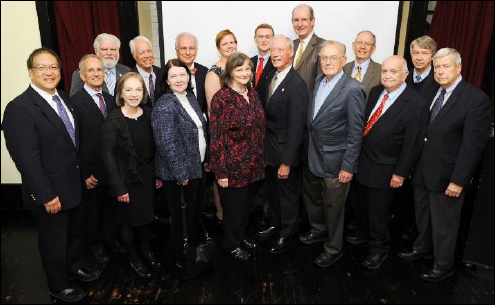 WHS, of which TK was a founding President, pledges to uphold his spirit of good science through friendship and mentorship towards enrichment of the wound science & care community and better care of our patients." - Sashwati Roy, President Wound Healing Society. "Visits with Tom were always something to look forward to. They were lively and covered topics from science to our families to advice and beyond. Tom's gift of both challenging and mentoring people shaped numerous careers and the field of wound research. It is exciting to see how many people he has directly and indirectly impacted. Tom was thrilled the Foundation named a lectureship after him and at almost every visit, said he hoped he could live up to the honor of the Hunt Lecture. Hopefully we will be the ones to pass on his passion for future generations of wound researchers." "Getting to interact with TK on a day to day basis has been a transforming gift of my academic career. At a time when I was a staff scientist at the Lawrence Berkeley National Laboratory primarily working on how reactive oxygen species may drive cell signaling, and had nothing to do with wound healing research, TK reached out and motivated me to get interested in wound healing. Without TK I would not be in wound healing sciences. TK personified inspiration and curiosity. The song has ended but the melody will linger." "The most memorable thing about Tom Hunt was his kindness; the space he had in his lab, in his heart, and in his life for anyone who asked, or was recommended, to be admitted. Over the past couple of weeks, I have connected and reconnected with colleagues from across disciplines and across the world. The universal thread of our conversations has been the influence of TK in our lives, and the gratitude we feel for his commitment to our development and success. His light will shine on through all of us." "Sad news, yes. But it is time to celebrate! Tom was a brilliant guy and had a great knack of finding young talent and bringing them together as he did in his lab in SF. I was at NIH in 1972 in a post residence lab position and he sought me out there—it was like the devoted Red Sox fan I am getting a phone call from Ted Williams! Think of the productivity of those he mentored. I quickly recognized that this was the way to develop a productive young lab and did my best to use this same formula with good success. Bringing the right people to the lab and then providing them with the environment to develop their own dreams and aspirations was his forte. He did not brag about their accomplishment as some lab chiefs have done. He did not get in the way of their recognition for their original accomplishments His work with lactate was the highlight of his science and some of his clinical work with O2 were highlights of his wounds healing accomplishments! He really helped me to get started in so many ways including the introducing me to the joys of skiing out West! His goals and objectives were clear and well done. Let us celebrate his life and his selfless contributions to others. His immortality is as a teacher along with his group achievements and his own original wound healing findings. Let us celebrate all the positive things he accomplished and the man himself." "I am really truly sorry that we no longer share “space” with Tom. Many of us come from humble origins, but not everyone remains humble as they achieve success. Tom did. A special person." "I cannot say enough good things about TK. He was a giant, respected by all. I was always in awe of how he carried himself. He made the world a better place." TK was truly a remarkable surgeon, researcher, mentor, and leader who inspired and guided so many of us. His legacy will live on for generations.